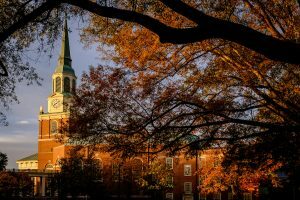 Wake Forest University will consider the application of any qualified student, regardless of disability, on the basis of the selection criteria established by the University which includes personal and academic merit. Upon matriculation, all students will be required to meet the same standards for graduation. The University endeavors to provide facilities which are in compliance with all laws and regulations regarding access for individuals with disabilities. Additionally, special services are available to reasonably accommodate students with disabilities. For more information on assistance for graduate students, please contact Van D. Westervelt, director of the Learning Assistance Center (http://www.wfu.edu/lac/) or refer to Disability Services on the Learning Assistance Center website (http://www.wfu.edu/lac/disability-svcs.html).